Get your own private horoscope for the week, for the month, or for any given period of time, and ask any question that you may want on any field of life. Personalized Horoscope There is 1 product. 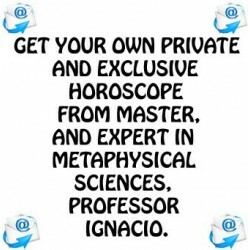 Obtain your own personalized horoscope and get your own personalized study of your zodiac for the week, the month, or for any desired time frame period; plus get also expert advice on any matter of life, on any pressing issue, or on any important decision.